I love the concept of a 'Food Walk'. First you go for an interesting walk, maybe see a few sights or an aspect of nature, then reward yourself with something nice to eat. The more you walk, the more you can eat. I visited the quaint seaside suburb of Port Noarlunga recently and spent a delightful couple of hours walking and eating. I thought I'd share this Food Walk idea with you. It's a circuit of only one kilometre, quite a leisurely walk, but definitely interesting. It involves two art galleries, a bit of local history and lunch at the charming Fleurieu Pantry as your reward. Park your car somewhere near the Esplanade so that you can enjoy the coastal views and, if the weather is nice, walk out on the jetty. It was erected in 1921 and is actually the second Port Noarlunga jetty. The first one was 30 metres south and was built in 1855. It had a tramway running along it to transfer produce from Noarlunga to ships bound for Adelaide. The Noarlunga mill closed, resulting in less wheat production, and so the jetty was left to deteriorate. This new jetty extends out to the reef, which you can clearly see if it's low tide. Look out for leafy sea dragons. From the jetty, follow Saltfleet Street until you reach Clarke Street, turn right then left onto Wearing Street. On the left, at number 21, you'll see Sauerbier House. The building is heritage listed and dates back to 1897 when it was owned by the Sauerbier family. Now it's a fabulous arts and events space and it's open Wednesday till Saturday. Sauerbier House Cultural Exchange offers supported artist and writer in-residence studios as well as an art gallery, writing gallery and regular events in the grounds. Pop in and have a look, there's always something to see. From Sauerbier House, head back along Wearing Street, turn right on Clarke and cross Saltfleet Street. You'll see Beck's Bakehouse on the left and a Vet on the right. Ahead is Gawler Street and another lovely Gallery. Port Noarlunga Arts Centre was Port Noarlunga Institute and Library in a former life. The Institute was built in 1924 and used for community social events. In 1929 a library was built next door. The Arts Centre now has three dedicated gallery spaces—The Foyer, Onkaparinga and Linear as well as a performance space, rehearsal rooms and a meeting room. Inside you'll see distinctly different exhibitions in each space. You'll also find lots of information about upcoming performances and events. Take your diary. Right next door to the Arts Centre is Patricia's Classic Interiors, an enchanting shop, chock-full of unique gifts and elegant homewares. 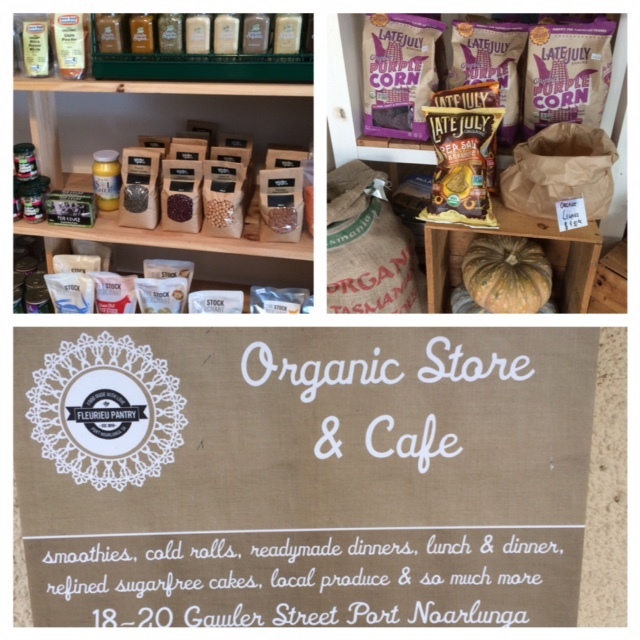 You'll need time to browse here and possibly purchase a treasure or two before heading next door to visit The Organic Store which is also part of The Fleurieu Pantry family. Here you'll find fresh local produce, bread, pastries, flours and grains, organic juices and more. Right next door to the Organic Store, tucked behind Patricia's Classic Interiors is a charming space with a laticework ceiling and quirky decor touches. This is The Fleurieu Pantry. The menu offers light meals, staring at just $3 for an organic sour-dough roll with olive oil and balsamic, and mains from $18. This time I chose Steamed Chicken Wontons with fresh Thai herbs, water chestnuts and sweet, sticky soy dipping sauce. Only $12 and oh my, such a delicate medley of flavours. There's a selection of dishes especially for children and each dish comes with an activity book. 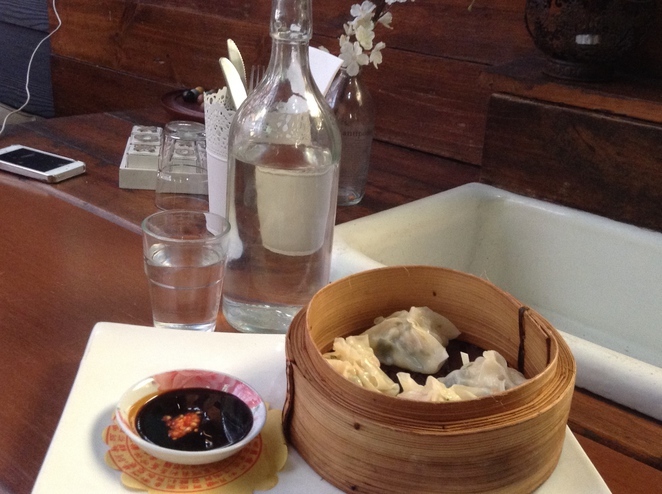 Steamed Chicken Wontons with fresh Thai herbs, water chestnuts and sweet, sticky soy. There's a variety organic juices to choose from as well as smoothies, tea and coffee. The tea comes in a real teapot with china cups and saucers. And The Fleurieu Pantry is licensed so you may want to enjoy a glass of local wine with your lunch. Everything here is wholesome, healthy, Fleurieu Peninsula food, so when you complete your walk and return to your car, you'll be feeling good. Why? The more we walk, the more we can eat. When: Arts Centre Mon-Sat. Sauerbier House Wed-Sat. Cost: Free admission to the galleries. Check The Fleurieu Pantry FB page for prices. There are so many nice little cafes in Port Noarlunga - Agetha's, Menoli's Mezes, Salty Lime - you can go back for several food walks and have different food each time! Would love to do this, soon!